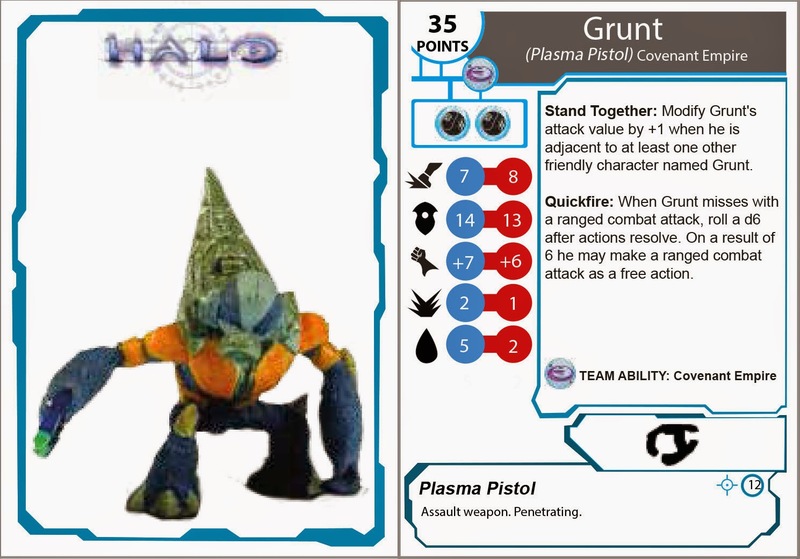 Halo Tactics is played using collectable miniature figures standing on a base. Together, the figure and the base are called a character. Each character has a corresponding stat card that lists its game statistics. Characters you play are called friendly characters, and characters your opponents play are called opposing characters. Characters can only be friendly to one force. Some game effects may change a character from friendly to opposing (or vice versa); when that game effect ends, the character returns to be friendly to the force it was friendly to before the game effect took place. A picture of the miniature that correspond to this card is displayed in the front of the card to facilities matching. Match the name on each stat card to the name on the base of the miniature. Your squad belongs to a specific faction, which corresponds to the sides participating in the battles that rage across the Halo universe. Factions have an special ability that affect the members of that faction, each faction special ability are explained in the Special abilities, in a future post. Each character’s stat card has a symbol that identifies which faction it can fight for. Characters must have the same faction symbol to belong in the same squad. The cost is the number of points you pay to add a character to your squad. A squad can contain up to 400 points of characters. This section provides information you need to play the game. A character has five combat values, this values are set in two columns next to the symbol of the same type: Speed, Attack, Defense, damage, and Health. Each stat is divided in two colours: Blue and Red. The blue Colum (also called Fresh stats) is the stats that the character MUST use when he has full health or more than half (rounded down) of his Initial Health. When a character health drops below half of his initial Health (rounded down) he become fatigued. When a character is wounded or fatigued he can only use the Red stat value. Then a Character health value is equal or less than the half of this initial Health (rounded down) he become fatigued. From that moment he can ONLY USE the secondary number (in the red circle) of his stats, this secondary number is called Fatigued stat. Speed: This is the number of MU (Measure units) or inches that the character can move when spend a Move action. Attack: is a measure of how effective the character is in combat. When the character makes an attack, roll two 6-sided die (2d6) and add this number. If the result equals or exceeds the enemy’s Defense, the attack hits. Defense: represents how hard the character is to hit in combat. An attacker must roll this number or higher to hit the character and deal damage. Damage: is how much damage the character deals when an attack hits. Health: Tells you the health level or how many wound had remaining the character, is time the character takes damage his health level decreases. When a character health reaches 0 is considered KO or out of play. When a character Health is equal or below of his Fatigued Health value, he become fatigued and from that moment, all his other stats change to his fatigued version. These include any special attacks, qualities, or limits a character has. Special abilities may override the general rules. Some characters can help the rest of their squad, directing them, encouraging them, or coordinating their attacks. These effects are listed here. Here you will find the rules for the weapon that the character begins the battle and the range in inches of this weapon (next to the Cross symbol), a target must be in a distance equal or minor of this value in order of being in range of your attacks. All the characters start the game using their blue stat value (also called Fresh stats). Some powers can only be used when a character is Fresh. This is indicated with a blue circle or symbol next to the power. Each time a character takes damage, his health value is reduce equal to the damage taken. When a character health is reduce to a number equal or below of half of his health he become fatigued. Each character has an arrow in his Health value that shows the Health number threshold for the fatigue value for easy reference. So for example, a Marine has Health 5 and Fatigue threshold of 2. So when he only have 2 or les of health is considered fatigued. When a character is fatigued he can only use the secondary stat of each one of the stats (speed, defence, attack, and damage), this secondary stat is in a red circle and is called fatigued stat value. His Health don't change, and he keeps the damage taken so far. If a character health increase during the game (using medpacks, special effects, etc), and his Health score is greater than his threshold value (his health/2 rounded down), he is no longer fatigued and use again his blue stats. When a character health value become 0 is KO and is retired from the game. Some characters are so large that one card is not enough. Usually this cards are use to hold special rules or weapons that the character posses. 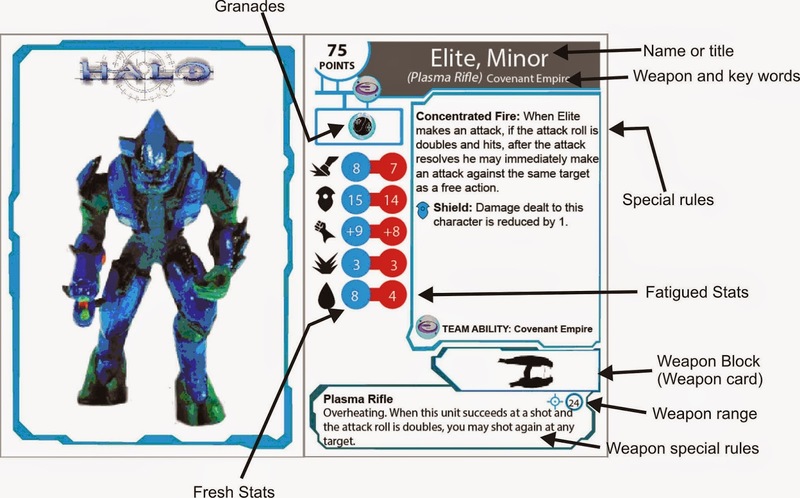 The first card has his statistics and the secondary special rules for the character. All characters start the game with a weapon asignated to them. This is also called weapon block or weapon card. In that weapon blog you can find the range of the weapon and the special rules that apply to the character when he make an attack using that weapon. Weapon damage: When a character use a weapon he makes a damage equal to his Damage value, some weapons increase this value. Swapping weapons: Characters can switch weapons with one another if they are on the same team and they are touching bases as a free action. 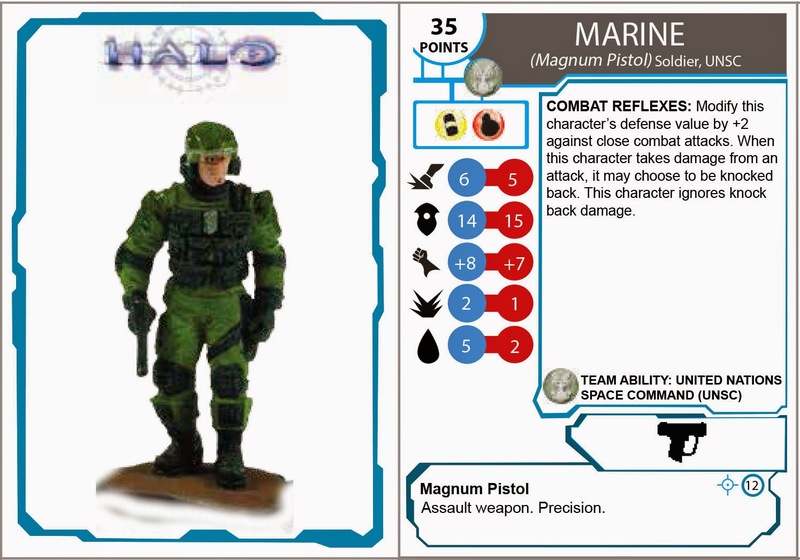 Dropping weapons: When a character is eliminated from the game for any reason, all Weapon and Halo® cards the character has will be placed on the space where he was eliminated. The next character to land on the space can claim some or all the cards as a free action. A character can carry only one weapon at the time (except for dual weapon sets) when he picks up a new weapon his old weapon is place it on the board.